But today, we are talking about Chips. Over dinner, myself and some friends spent the best part of an hour discussing, ruminating and debating over the best kind of Chip. 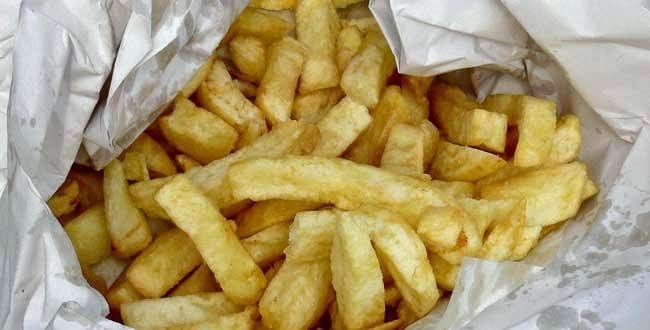 If the length and volume of our conversation is any measure, it is apparent that many of us feel quite passionate about our Chips. 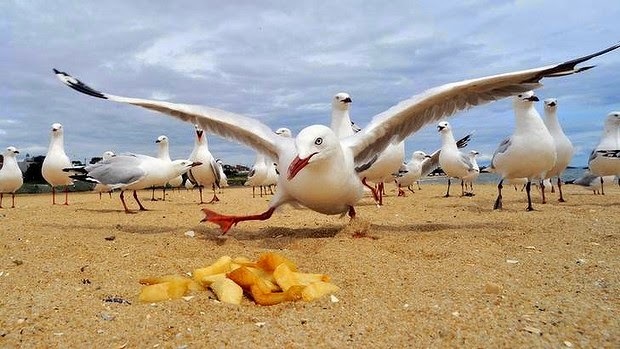 "No thanks, I'm just not that keen on chips." b) Our Methodology to attain the Perfect Chip. The Chip-Loving World seems divided on this. Some fall in the Golden and Crisy camp. The ones that maintain their perfect form as they travel from wrapper/plate to mouth. You do not need to take in to account the Droop Factor to avoid getting red, brown or curry sauce on your knuckles. There is an audible crunch as you bite through the crispy outer and discover the fluffy, steam-emitting carby interior. Others, the Pale & Soggy camp. If you detect some bias, you would be right. I love a pale and soggy chip. The advantage with this chip is that when you shake the salt on, it doesn't ricochet off on to the table. 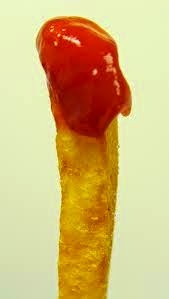 There is high Droop Factor with this chip. You must dangle to dip (Copyright : Roo) but, what happens next is a matter of personal preference. I recommend the technique known as the Baby Bird. Tip head back, drop chip in. It is un-ladylike but it will minimise greasy fingers and getting sauce all over yourself, including your chin (also un-ladylike). Comfort Food Quotient is exceptionally high with the Pale & Soggy. It is like a curling up on the sofa, with a duvet, with BBC's Pride & Prejudice on the box. For the duration, all is well with the world. Also, you feel a little Edgy. A little Dangerous. A little Screw You, World. You know it is bad but, like all Bad Things it is soooooooooo good. Can we have a show of hands? Sometimes, you cannot eat them straightaway. Sometimes you have to drive, or walk, them home. Sometimes, you need to carry them to where everyone else is sitting on, let's say, the beach. And remember, there's that seagull. Wrap them up tight, in a plastic bag? ...... tear a hole in the paper to let the steam out to avoid Steam-induced Sogginess, which is the evil step-sibling of Yummy Greasy Sogginess. A further opportunity for heated debate. Convention might suggest, Salt THEN vinegar. In our household, we have gone with Vinegar, then Salt. 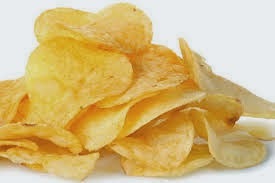 I never met a chip I didn't like. Clearly, there are some that I like better than others. 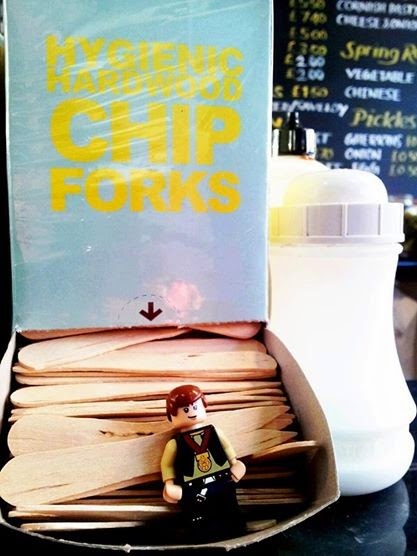 Some may scoff at my Enthusiasm for the Humble Chip. But I am willing to bet, that if presented with a bowl, plate or bag of chips - most of you will scan, select and eat individual chips in order of preference. According to your own unique set of criteria. If that was your bag of chips, you would pick which you would eat first. 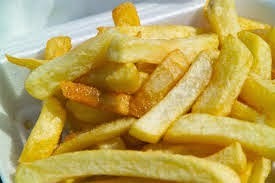 Are thick cut potato wedges (with the skin on) still on considered chips? Yum..